Listening as I type, it a big winner. 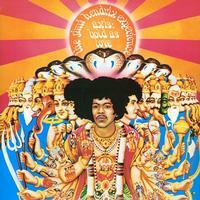 I recommend it to any Jimi Hendrix Experience fan. Bass is fleshed out so nice, and the highs are like hearing them for the first time. Not much that you can say about Hendrix that hasn't already been written but I don't think it is an exaggeration to say that hearing him for the first time (Are You Experienced) was life altering. I had simply never heard anything like it and I was an immediate convert. Jimi changed everything. I honestly can't recall exactly how many copies of this title that I have purchased over the years but I am old enough to have started with the original vinyl issue here in the U.S. in 1968. I have "upgraded" with various imports and every remaster (CD & vinyl) over the years and now I have pulled the trigger once again with the latest SACD from Analogue Productions. I believe that I can now downsize by getting rid of all of the other CD copies that I currently own of Axis because this is the best of the bunch. It brought a smile to my heart to hear this in it's best-ever incarnation. Highly recommended! I can't wait for the vinyl to be unleashed!